Concerning nominee Judge Brett Kavanaugh one can easily scrutinize the abject buffoonery and fiasco known as “advise and consent” presented by the US Senate Judiciary Committee sham and deception. I find it particularly necessary to single out US Sen. M. Hirono of Hawaii for censure and reprimand for the unjustified, inane and uncalled for attacks and allegations lacking even one iota of due process evidence, presumption of innocence or corroboration in her recent diatribe and verbal assault upon the excellent character of Judge Kavanaugh. It seems that one’s memory is always a fault and so I find it quite necessary to prompt and remind Sen. Hirono and others like her of what I personally recall at the outset of World War II (1941) and what happened after the Japanese attack on Pearl Harbor in Hawaii. Under then President Franklin Roosevelt an occurring in unrestrained panic and discrimination, minus a tater of evidence and lacking any semblance of “due process” 125,000 Japanese-Americans were rounded up, forced by the US government to abandon their property, farms, businesses, homes and jobs and carted off to detention camps located throughout the American west. Concurrently, the FBI under director Hoover found no evidence of any treasonous activities against the United States. While still deposited in detention camps (1943) countless Japanese-Americans volunteered for active duty in the US Army (442nd Reg. and 36th Texas Div.) and fought with great courage and distinction in the European Theater of Operations. Yet Sen. Hirono ignores historic facts and now finds it quite fashionable to be politically correct and comfortable, unconcerned untroubled and unembarrassed, as she neglects, disregards and snubs the American scales of justice, presumption of innocence, fairness, impartiality and square shake conformity to moral principles regarding and in respect to Judge Kavanaugh. In short, Sen. Hirono is like many other members of the Senate Judiciary Committee, afflicted with the virus of malevolence and mob rule in pursuit of total control. 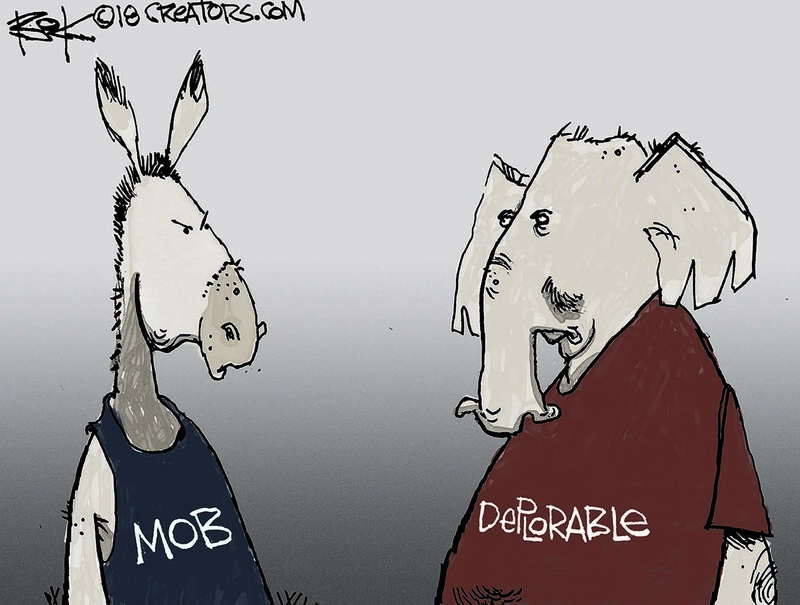 The Democrat Party has now been snared and shifted its political policy in full support of the “guilty until proven innocent” norm and standard of conformity in their lust and greed for political power. Such a policy is nothing short of communism and a disgrace to American ideals of justice. If things continue as some Democrats want, the US may end up looking like the old Soviet Union. Nov. 6, 2018 may be do or die for this republic. Be sure to get out and vote before it’s too late.